TV5 celebrates the birthday of Philippine showbiz’s living icon, the Comedy King Dolphy, with a two-hour special entitled “Talentadong Pidol” this Sunday, July 24. Hosted by Talentadong Pinoy host Ryan Agoncillo, the show features a spectacular gathering of the biggest stars in what can be dubbed as the most emotional birthday celebration ever done for the Comedy King. With no less than the triumvirate of Tito, Vic and Joey opening the show, Talentadong Pidol is a nostalgic journey honouring Dolphy’s remarkable achievements and contributions to the movie and TV industry. Kapatid stars and the industry’s biggest names greet Dolphy by way of touching messages and special performances that will make the show replete with laughter, emotional delight, inspiration, and admiration for a one-of-a-kind man. 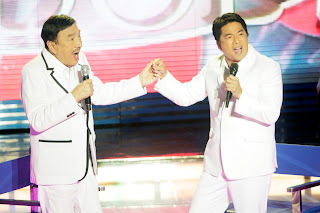 Highlighting the occasion is a rare moment wherein Dolphy teams up with Willie Revillame in a touching song medley about friendship, love and their dedication to the entertainment industry. Willie also gives a surprise presentation that will make the Comedy King wax emotional. Known as the ladies’ man who had real-life romance with his on-screen partners (such as Pilar Pilapil, Nida Blanca and Alma Moreno), Dolphy pledges his undying love for his queen, the Divine Diva Zsa Zsa Padilla. They will perform an inspiring duet that will communicate to everyone the extent of their love for each other. Dolphy will also hear from his dearest friends in the industry, such as Boots Anson Roa, Gloria Romero, Eddie Garcia, German Moreno, Nova Villa, Niño Muhlach, Vice Ganda, Pokwang, Lucy Torres, Richard Gomez, Eric Quizon, Claudine Barretto, Ruffa Gutierrez and Alice Dixson. Unknown to many, Dolphy started out doing drama as a radio talent. Known as Rodolfo Vera Quizon Sr in real life, he was first given the stage name “Golay” as he made his first big break in the industry. His talent in dancing and singing was later discovered when he paired up with the late Bayani Casimiro Sr.
Dolphy then evolved into the dynamic and versatile performer who endeared himself to every Filipino. He went on to essay gay characters in movies such as Jack en Jill, Pacifica Palayfay, Fefita Fofonggay, among others. He also made a mark with his unique fashion sense, particularly the “puruntong shorts” that became his trademark for some time. Directed by Al Quinn, Talentadong Pidol enjoins viewers in a memorable tribute to the industry’s one and only Comedy King. This Dolphy birthday special airs on Sunday, July 24, at 8:00 p.m. on TV5.